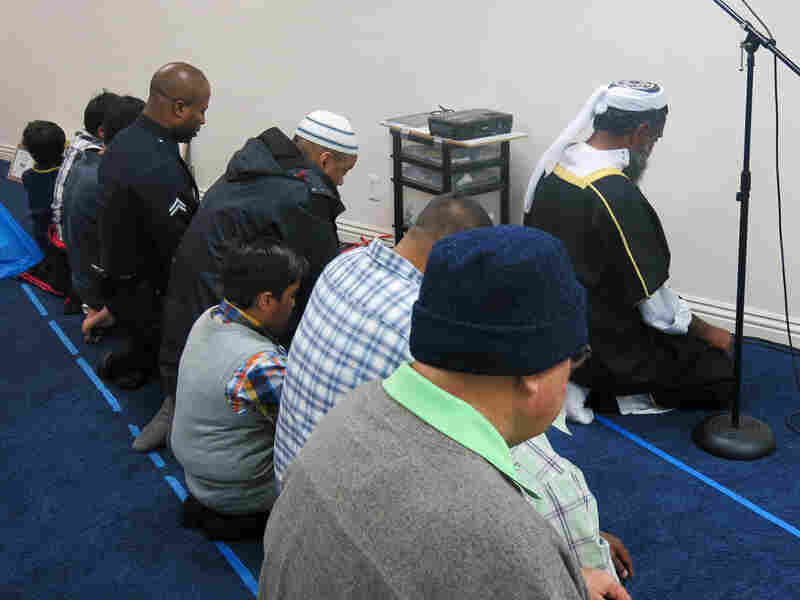 Counterterrorism Cops Try To Build Bridges With Muslim Communities To combat homegrown terrorism, community engagement officers in some cities are building relationships with Muslims. The hope is to increase trust — and the likelihood that threats will be reported. 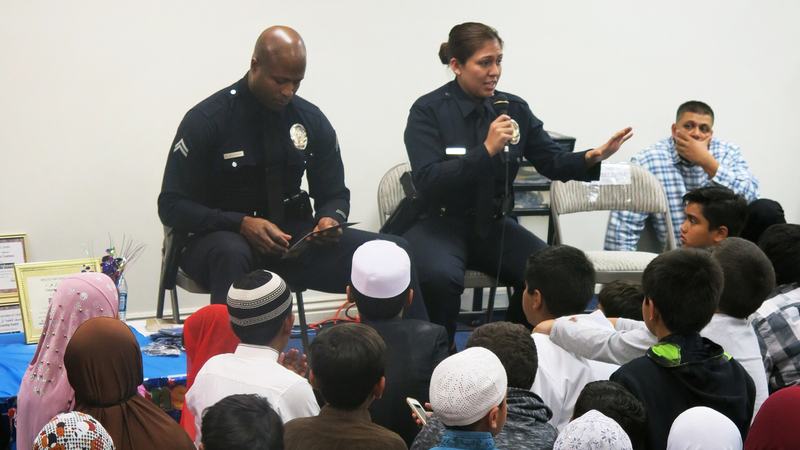 Shawn Alexander and Ashley Jimenez visit a madrassa in the Los Angeles area. The two police officers are part of the Los Angeles Police Department's counterterrorism bureau, which is focused on fostering community engagement. The attack that killed 14 people in San Bernardino, Calif., earlier this month raised the alarm over so-called homegrown terrorism, attacks that aren't necessarily coordinated from overseas. A few days after the massacre, FBI Director James Comey described the challenges of detecting those threats in a hearing of the Senate Judiciary Committee. "Critical to our finding those people who are radicalizing in their homes is tips from the community," Comey said. "We have worked very, very hard to develop good relationships in communities all across the country — especially in Muslim communities." But the FBI is regarded by many American Muslims with suspicion, in part because of misgivings about a legacy of federal sting operations that are perceived by some as efforts to entrap Muslims into planning theoretical terrorist attacks. Local law enforcement, on the other hand, says it is well-positioned to develop relationships with Muslim communities. "It's no different than how we work with young people who want to join gangs," says Sheriff Rich Stanek of Hennepin County in Minnesota, where local law enforcement has been struggling with the question of how to dissuade the youth of recent Somali immigrants from becoming radicalized. "We want to know what's happening in the communities, and that's all based on trust. Local law enforcement has to trust them, and in order for that to happen, they have to be able to trust us." In a sense, it's an adaptation for counterradicalization purposes of good old-fashioned community policing methods. This approach is often called countering violent extremism, or CVE, a philosophy built on the idea that law enforcement can help isolated communities such as recent immigrants to feel more invested in society and, as a result, make them more likely to detect threats such as self-radicalization. "In a sense, it's an adaptation for counterradicalization purposes of good old-fashioned community policing methods," says Anders Strindberg of the Naval Postgraduate School's Center for Homeland Defense and Security. Local police are ideally situated to bring marginalized immigrant communities into the mainstream, he says — and make them more likely to report threats. "I know this sounds kind of crunchy," he says, "but what you really need are communities that feel a level of trust and integration that allows them to reach out." This philosophy is officially part of the federal government's anti-terrorism strategy, but Strindberg says it's been hampered by an internal struggle over whether the FBI or Homeland Security should take the lead and over what the role of local police should be. Strindberg says that debate has been "vitriolic" and has wasted valuable time. There's been skepticism among Muslims. "If there is such a program — which I don't believe there is in the United States — it's an idea, it's a framework," says Salam Al-Marayati, president of the Muslim Public Affairs Council. Marayati says CVE suffers from being too vague about its goals. He wants to make sure these friendly, relationship-building cops don't start asking questions about religion or social customs. And, he says, people need to be clear about what should be reported to police and what shouldn't. "I mean, if it's stockpiling ammunition in somebody's apartment and buying explosives, of course they should report that kind of behavior. But if it's just about how a person is dressed, or how a person is religious, then no," Marayati says. While some local police have embraced the CVE concept with community engagement officers, Strindberg says those efforts are often hard to maintain, in part because they're hard to quantify. "The problem with community policing is the metrics are terrible," he says. "The metrics are not about tangible achievements in the sense that a lot of bureaucracies want to have available to them, but rather it's about things that didn't happen." Alexander (at left), a practicing Muslim, prays during a visit to a Los Angeles-area madrassa, part of his unit's outreach to the Muslim community. Still, some cities are pressing forward with this approach. The Los Angeles Police Department's counterterrorism bureau has officers who are dedicated primarily to building relationships with what they call the city's "diaspora" communities. Shawn Alexander, one of those officers, makes a point of telling the people he works with that he's not focused on investigations — even though he's part of counterterrorism. He and his partner, Officer Ashley Jimenez, work in community engagement. "We're totally separated from our investigators. The hunters and pursuers, we don't engage with them, they don't engage with us," he says. A practicing Muslim, Alexander says that when he visits a mosque or a madrassa in the LA area, he wants to make it clear that he's not there to spy. "If we're there for information-gathering or investigation purposes or we're trying to get information on the community, it's kind of a slap in the face of the community," Alexander says. "It's like telling the community we're here because we think something is going to happen here. But that's not why we're there." Does he believe this approach has prevented radicalization or violence? It's impossible to know, Alexander says, but he is convinced of the value of approaching these communities in the role of a public servant and not an investigator.